He turned the car around and went back to his house. We pulled in the drive way and he invited us inside. We stayed in the foyer with our shoes on and his wife came out. We greetted each other and the man disappeared into another room. He came back right away carrying a wooden box and sat on the floor to show us.. Not a lick of metal on this box. Hinges, handles and clasps, all wood. 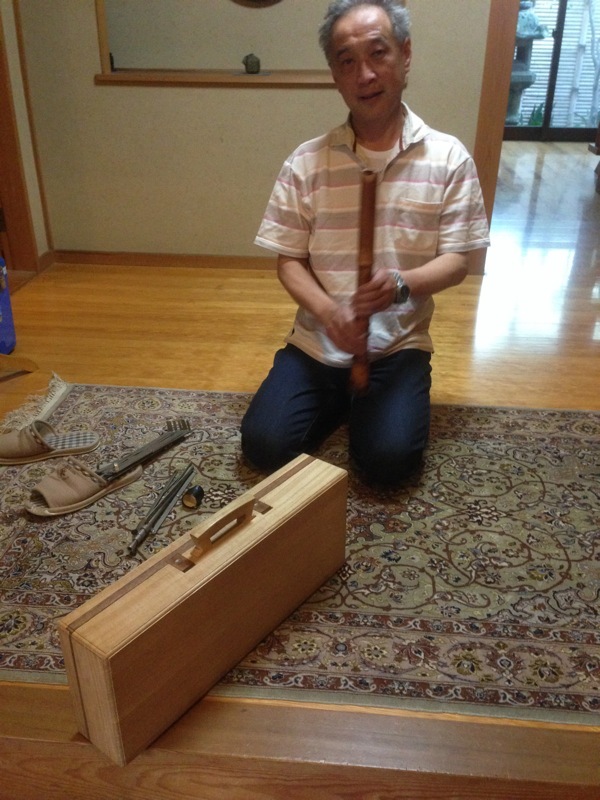 Before we could truly marvel at it, he opened it up, and inside was a bamboo flute and music stand. It was a case for his flute! Without prompting he began to play a song. It was “America the Beautiful”. We stood silently, probably with our mouths hanging open, listening to our little private concert in this strangers house. When he finished we all laughed and smiled and bowed low. Before we could express anything else, his wife came back in the room speaking frantically. Our bus was coming and we must leave if we want to catch it! The three of us charged out of the house, hopped in the car and made it to the bus stop right as the bus arrived. We got out of the car said our goodbeyes and ran to the bus. We climbed aboard and stared at each other dumbstruck by the kindness and hospitality this man demonstrated. And we didn’t even get his name.